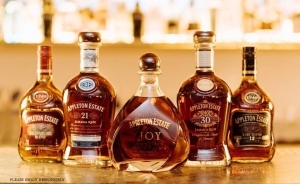 Appleton Estate Signature Blend, Appleton Estate Reserve Blend, Appleton Estate 12 year, Appleton Estate 21 year, Appleton Estate Joy and last but definitely not least, The Appleton Estate 30 year. We were certainly in for a treat! 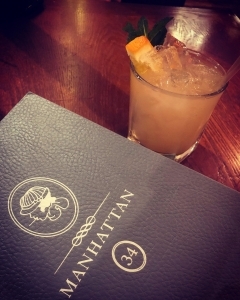 On arrival we were warmly welcomed with an Appleton Mai Tai which was well made and delicious . We were taken downstairs to a nice intimate setting for the tasting and were introduced to Rory and Joe who would be leading the tasting. It was also nice to see Nilesh from 23 Wine and Whiskey which actually stocks a good range of Rum too. 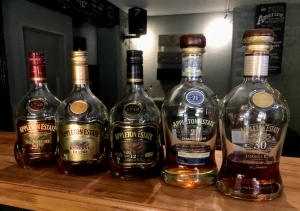 Joe started by gauging the Rum knowledge in the room and by sharing a few basic facts, such as; in Europe Rum must be made from derivatives of sugar cane and be at least 37.5% alcohol by volume. This was followed with a brief overview of different styles of Rum. The rules for Rum production vary across different countries. Joe discussed fermentation, types of still and how distillation is where flavour and character can be imparted depending on the type of still and blending afterwards. On the bottles of Appleton Estate Rum you will notice 1749 which we were told is the first recorded documentation of Rum production on the Appleton Estate (likely for tax purposes) but production would have more realistically started in the mid 1600’s. It is the oldest distillery in Jamaica located in the Nassau Valley and has both pot and column stills. The Nassau Valley is the perfect environment to produce Rum with fertile soils and an ideal climate. The surrounding limestone is a perfect filter for the water used in the process. 9 different types of sugar cane are grown on the Estate. Jamaica operates a sugar pool so all producers have to sell their sugar to the Jamaican government then buy it back at a higher price which constitutes the paying of taxes. This all happens on paper and the molasses always stays on the estate so Appleton know their own is being used to produce their Rum. You could say that because of this, terroir could be discussed alongside Appleton Rums. Joe briefly discussed dunder which is the stuff left over after the distillation process which can be used in future fermentations to add flavour. Jamaican Rum certainly has distinct aromas and taste and some say ‘Funk’. However, Appleton do not use dunder and all of their character comes from the fermentation and distillation process. Each distillation is called a mark and each goes into a set of barrels. American Oak barrels are used which, as with most Rums, adds a vanilla flavour. Consolidation of barrels keeps the marks together and addresses evaporation or as it’s known in Jamaica, the Duppy’s share. 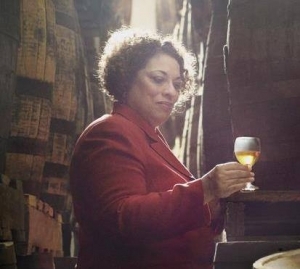 The Master Distiller is Joy Spence, the first female Master blender in the world. This is someone with an incredible nose and palate. Something I didn’t know was that Joy was originally a chemist at Loughborough university! Earlier I mentioned the rules surrounding Rum. In Jamaica no additional sugar can be added, only water and small amount of caramel. 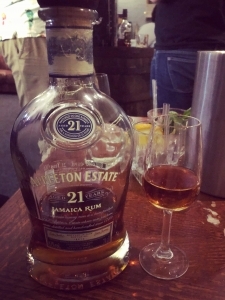 The first Rum we tasted was the Appleton Estate Signature Blend. This is a Rum blend of 15 different marks with an average age of 4 years. This is considered an entry level Rum, mainly for mixing. It has a golden colour in the glass and citrus and sweet notes on the nose. The finish is quite short. Rum two was the Appleton Estate Reserve. This has a blend of 20 Rums with an average age of 6 years. It has the highest proportion of pot still. The nose is still citrus and sweet but now with more Jamaican funk/Fusel oil as well as spices and oak. It is more complex than the Signature Blend with a longer finish. Rum three was the Rare Blend, 12 year old. Jamaican law states that if there is an age statement on the bottle then that is the minimum aged Rum in the blend. In the glass it is a deep bronze colour. The nose is similar to the Reserve but with more chocolate and coffee notes. This Rum has a lovely mouth feel and long finish. It is a bit of dark horse in my opinion. Rum four was the Appleton Estate 21. As said before this means it is a blend of Rums with a minimum of 21 years aging. The nose is similar to the 12 year but somehow more subtle and complex at the same time. It is initially subtle then develops in the mouth as well. This has complexity and depth, is an outlier in the range and is likely to be enjoyed by cognac drinkers. Rum five was a ‘Joy’ in both name and taste. 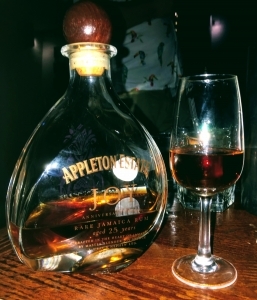 This is a blend of Rums from 25 to 35 years to celebrate the 20th anniversary of Joy as the master blender at Appleton Estate priced at £220. We learned that her nose is insured for $1,000,000. NASA also employed Joy to smell space dust to tell people what space smells like, apparently raspberries! 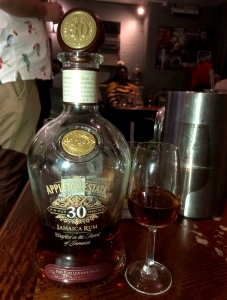 The final Rum was the recently released 30 year old of which there are 4000 bottles. This was originally a release for the visitor centre at the distillery then was released worldwide with approximately 300 bottles in UK priced at around £400. The evening closed with further discussion with Rory and Joe and Roop Kahlon also made an appearance. We were lucky to get a look at the 50 year old but sadly no taste of this one. 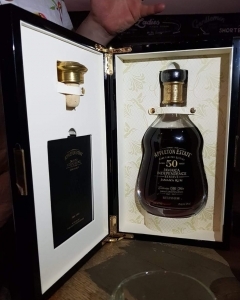 There were only 800 bottles produced to celebrate the 50 year anniversary of Jamica’s independence. All in all, a great night with good people! Great recap of the Appleton rum estate tour. I took it last year myself and had a great time.